PhotoBucket, the FIM-owned photo sharing goliath that sees over 25 million monthly uniques, is taking aim at becoming the dominant photo sharing service on Twitter. The company has quietly launched TwitGoo, a media-sharing service designed from the ground up to be Twitter-friendly, allowing users to share photos with only a few clicks (and movies are on the way). PhotoBucket used to be one of the small guys, coming from nowhere in 2006 to emerge as one of the Internet’s largest photo providers. Much of its initial growth was driven by its ability to thrive on a popular social site – in this case it was MySpace, which previously didn’t have many easy options for embedding photos. Now the tables have turned, as TwitPic has come from a similarly unknown position to become the leader in sharing photos on Twitter. Traffic may still be relatively modest compared to more orthodox photo sharing sites, but with Twitter poised to become a mainstream phenomenon, media sharing is going to take off fast. PhotoBucket competitor Imageshack launched its own service in February. And now PhotoBucket wants a piece. TwitPic is the dominant player in this space with over 1 million users, but the one-man operation is having trouble coping with its rapid growth – an issue that will likely become even more of a problem as Twitter becomes more mainstream. Conversely, TwitGoo is built on the same infrastructure that powers PhotoBucket and its sister site TinyPic, which means that it should have no problem coping with a massive influx of new users. TwitGoo’s other advantage is that it will likely be perceived as more friendly to brands than startup services like TwitPic. At this point this isn’t much of an issue, but as more brands begin to embrace Twitter and create their own applications that tap into the service’s API, they’re going to want to direct any media-sharing functionality through a trusted service. PhotoBucket and its parent company FIM have already built relationships with these brands. And the site also screens content for obscenity – something that no small-time operation can do effectively. The service itself will be familiar to anyone who has used TwitPic or any of its competitors. 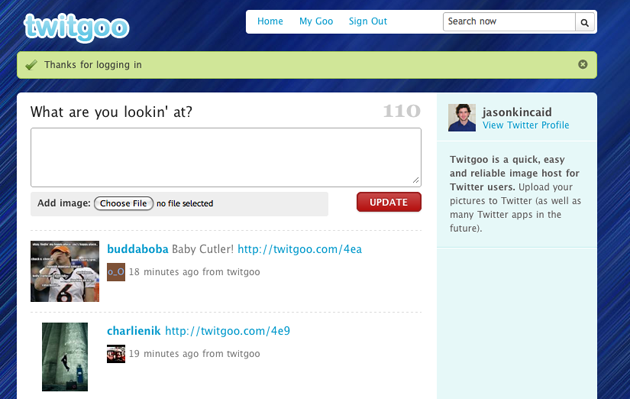 Users sign in to TwitGoo with their Twitter credentials and then upload a photo to generate a URL shortcode, which they can then Tweet directly from the service’s web interface. The site tries to maintain the look and feel of the native Twitter interface, importing user backgrounds and consistently placing links where you’d expect them. And in the not-so-uncommon event of Twitter downtime, the service features a backlog queue, which allows desktop clients and other API users to queue their submissions for when the Twitter system comes back up. Of course, one of the things that has made TwitPic so popular is that it is integrated into many Twitter clients, including favorites like TweetDeck and Tweetie on the iPhone. TwitGoo is on very few of them, though it is hoping to catch up on this front quickly and is launching with a full API. The service is also in discussions with a number of major Twitter clients, though it can’t discuss specifics yet. This is really where the battle will be won or lost – on Twitter it doesn’t matter how nice your infrastructure is unless its third party clients support your service.